The meeting occasioned a substantial exchange of views on Romania's cooperation with the Jewish organisations, as well as on education of the society at European and international level in the spirit of tolerance, non-discrimination, combating anti-Semitism and cultivation of the memory of the Holocaust. Both parties voiced concern over the appearance of some populist-extremist and anti-Semitic trends in Europe, which are also reflected at political level, while appreciating at the same time the need for strengthening joint efforts to combat them, including by educating the younger generation. Thus, the Romanian dignitary reaffirmed Romania’s constant commitment to the fight against anti-Semitism and thanked for the involvement of the Laude-Reut Educational Complex in Bucharest in developing educational projects for the younger generation. At the same time, both parties highlighted their wish to boost this cooperation and strengthen the relation of confidence and the honest and open dialogue. Moreover, the Romanian official informed about the Romanian Government's intention to invite all the special representatives for fighting Anti-Semitism to Romania for a meeting. The President of the World Jewish Congress Ronald Lauder, thanked Romania for its constant and dedicated efforts made in acknowledging its historic past, as well as in honouring the memory of the victims of the Holocaust. In this context, Ronald Lauder also invited the Prime Minister of Romania to pay a visit to New York, in this year's autumn. Ronald Lauder became the President of the World Jewish Congress, in June 2007. Along time, he got involved in numerous international philantropic activities that the organization carried out internationally. In 1986, Ronald Lauder was designated Ambassador to Austria by President Reagan. Later, his activity focused on revitalizing the Jewish communities in Central and Eastern Europe, affected by what happened during the Holocaust and also during the communist regime. In 1987, he laid the foundation of the Ronald S. Lauder Foundation, which now has 37 branches in different states such as: Austria, Belarus, Bulgaria, Czech Republic, Germany, Hungary, Poland, Romania, Slovakia and Ukraine. The World Jewish Congress is an international organisation which represents the Jewish communities and organizations in over 100 states of the world. The Congress negotiates on behalf of communities with the Governments, Parliaments as well as with other international organizations. The Organization was founded in Geneva, in 1936. Prime Minister Viorica Dăncilă has opened today, in Brussels, the works of the Conference: ”Fight against anti-Semitism: a common approach to better protect Jewish communities in Europe – from policy to action”. The event is organized by Romania under the aegis of the Romanian Presidency of the EU Council and aims at promoting debates between members of the Jewish communities in Europe and the representatives of European institutions, on combating anti-Semitism. The conference was inaugurated by Prime Minister Viorica Dăncilă alongside Mr. Frans Timmermans, First Vice –President of the European Commission, and Mr. Heinz Becker, Chair of the European Parliament's working group on anti-Semitism. Opening remarks were delivered by Ambassador Ronald Lauder, President of the World Jewish Congress, Mrs. Raya Kalenova, Executive Vice President and CEO of the European Jewish Congress, Mr. David Harris, CEO of the American Jewish Congress and Mr. Daniel Mariaschin, CEO and Executive Vice President of the B’nai B’rith Organisation. At the same time, Mr. Isaac Herzog delivered live remarks, via satellite. In her speech, the Romanian Prime Minister reminded that Romania’s priorities at the EU Council Presidency include in the fourth pillar, Europe of common values, topics linked to combating racism, intolerance, xenophobia, populism, anti-Semitism, and deterrence of hate speech. Thus, in the current European context, marked by the worrying rise in anti- Semitism, promotion of the exchange of views, ongoing consultation with Jewish communities as well as their involvement in the measures taken are vital for drawing up efficient solutions to combat the phenomenon. „Despite all current instruments and initiatives, anti-Semitism represents a rising problem in European societies. Such worrying developments require an unequivocal response, determined one from European forums and EU Member States”, reminded Prime Minister in his speech. The event enjoyed the presence of senior representatives of the European Parliament, Romanian MEPs, and from the other EU member states, members of the European Commission and Jewish communities in Romania (members of the Federation of Jewish Communities in Romania) and also from other states such as: USA, France, Germany, Bulgaria, Sweden, Czech Republic, Great Britain, Italy, Western Balkan states. Members of the diplomatic corps and representatives of student associations also attended the conference. The International Conference: „Fight against anti-Semitism: a common approach to better protect Jewish communities in Europe – from policy to action” reflects the Romanian Presidency’s preoccupation with giving an adequate response to the rise of intolerance phenomena and anti-Semitism manifestations, at European level, which could be noticed in the survey on perceptions of anti-Semitism, conducted by the European Union Agency for Fundamental Rights(december 2018)and by the special Eurobarometer of the European Commission on anti-Semitism, published on January 21, 2019. The event held in Brussels also illustrates the priorities of the Romanian presidency of the EU Council, set out in the pillar „Europe of common values”. They pursue among others: effectively combating racism, intolerance, xenophobia, populism, anti-Semitism, and deterrence of hate speech. The main objective of the Conference is promotion of a substantial debate between members of Jewish communities and representatives of European institutions and organizations, as well as national representatives with a view to identifying concrete actions, better oriented to combat anti-Semitism. Allow me to recall the words of a great man who was born on Romanian soil, Elie Wiesel who stated, on the occasion of the award of the Nobel Peace Prize, that : „when human lives are endangered, when human dignity is in jeopardy, national borders become irrelevant”. I would want the words of this „messenger for humanity” to guide us in our today’s approach. The international conference I had the pleasure to open today represents a very special event of the Romanian presidency of the Council of the EU, as a direct illustration of our priorities. One of these - Europe of common values – pursues efficiently fighting racism, intolerance, xenophobia, populism, Anti-Semitism and deterring hate speech. In the current European context, marked by an worrying rise of intolerance phenomena, this event is aimed at promoting a substantial debate among the members of the Jewish communities in Europe and in the United States, representatives of the European organisations and institutions, as well as national representatives. Between March 2016 –March 2017, Romania exercised the presidency of the International Holocaust Remembrance Alliance (IHRA). The decision to take over the presidency of this organisation reflected Romania's strong commitment in acknowledging its own past, honoring the victims of the Holocaust and getting involved in the international actions against Anti-Semitic, extremist and xenophobic manifestations. Also, by implementing the recommendations of the Wiesel Commission, Romania wants to contribute to the consolidation of Holocaust education, preserving public memory of the Jews suffering, as well as the Roma genocide, so that the lessons of the past become our foundation for peace and stability. One of the important achievements of the Romanian presidency of the International Holocaust Remembrance Alliance is the adoption of the working definition of the anti-Semitism. The Romanian diplomacy had a major contribution to this, through the involvement of the late Ambassador Mihnea Constantinescu, former President of the International Holocaust Remembrance Alliance, in the memory of whom we organised this very event. I seized this opportunity to announce you that steps are being made for the Romanian Diplomatic Institute to be named after Mihnea Constantinescu. The echoes at international level of the adoption of this definition were significant: the European Parliament in June 2017 passed a resolution regarding the fight against anti-Semitism, which I also signed in my capacity as MEP on behalf of the Social Democratic group, whereby the EU member states were invited to adopt the definition at national level. Therefore, Romania marked an important step in combating anti-Semitism at European and world level. Our country's approaches are in line with the drawing up by the European Commission of a Code of Conduct for combating online hate speech and for the adoption of the Declaration of the Council regarding the fight against Anti-Semitism and the setting up of a common security approach to protect the Jewish communities and organisation as best as possible. Despite all these current instruments and initiatives, however, as the recent survey conducted by the European Agency for Fundamental Rights also found, anti-Semitism represents a rising problem in the European societies. I believe that the promotion of an exchange of opinions, the ongoing consultation with the Jewish communities, as well as their involvement in the measures considered for combating anti-Semitism are absolutely necessary. Events like the one today are important for fulfilling the objective of combating discrimination and extremist discourses and to make sure that tragedies such as the Holocaust shall never happen again. Currently, Romania has become a regional model in combating anti-Semitism and xenophobia and, also, a model in what concerns education and measures taken to preserve the memory of the Holocaust. Many of you here in the room are friends of Romania, who have been close to us during this extraordinary journey of recovering our memory and understanding our peers. I thank everyone again and I hope that we will have them close in the future too. Therefore, I invite you to see each other again in early March at an event held this time in Bucharest, where we will have the occasion to discuss, especially, about the preservation of the memory of the Holocaust. I would like to thank you for attending this event today and I wish you greater success in the conference sessions! Prime Minister Viorica Dancila had a bilateral meeting in Brussels with the Executive Director of the American Jewish Committee, David Harris. The discussions took place in the context of Prime Minister's participation in the conference ”Fight against anti-Semitism: a common approach to better protect Jewish communities in Europe – from policy to action”. 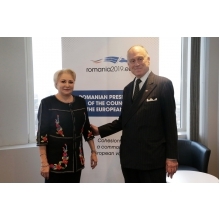 On this occasion, Prime Minister Viorica Dancila presented the priorities of the Romanian Presidency of the EU Council, with emphasis on intensifying European joint efforts to fight anti-Semitism and denial of the Holocaust. At the same time, Prime Minister thanked the interlocutor for the substantial participation in the conference organized by the Romanian Presidency. In this context, the Romanian Prime Minister mentioned Romania's recent ongoing projects on promoting Holocaust education and combating anti-Semitism and conveyed thanks for the continued involvement of the American Jewish Committee in supporting these projects. The Romanian official expressed satisfaction with the longstanding partnership with the representatives of the American Jewish Committee and with the constant support of the organization for the development and deepening of the Romanian-American dialogue. At the same time, both parties outlined their wish to boost this cooperation and to intensify dialogue. In this respect, the Head of the Romanian Executive reaffirmed Romania's commitment to participating in international efforts to combat anti-Semitism and any form of extremism, racism and highlighted the recent achievements in this respect. David Harris, Executive Director of the American Jewish Committee, is particularly active in lobbying activities for Israel, fighting anti-Semitism, monitoring the situation of Jewish communities, and promoting inter-confessional tolerance. He distinguished himself by supporting the emigration of about 1 million Jews from the Soviet Union and fully supported the Jewish movement in the USSR. He was the first leader of an American Jewish NGO who addressed the Davos World Economic Forum at a session chaired by Tony Blair. He has more than 10 decorations offered by the governments of Azerbaijan, Bulgaria, France, Germany, Italy, Latvia, Poland, Spain and Ukraine for outstanding activities in support of human rights, Transatlantic partnership and Jewish community. The Jewish American Committee is one of the most powerful Jewish organizations in the US. Since its inception in 1906, the organization has been campaigning for the unitary promotion of the interests of the Jewish community, building bridges between communities, fighting anti-Semitism, and promoting Israel's aspirations for peace and security. The organization has subsidiaries in 26 U.S. cities, seven liaison offices outside the US, and 31 partnerships with Jewish organizations around the world. It acts primarily to promote and defend the interests of its members by actively and consistently engaging in US domestic policy, in order to affirm and respect principles such as equality of rights and protection of human dignity. The Jewish American Committee has developed a strong component of global diplomacy and public communication. Prime Minister Viorica Dancila met today in the context of her visit to Brussels, with the President of the European Council Donald Tusk. The discussion agenda included topical issues on the European agenda. Prime Minister Dancila voiced appreciation for the active engagement of the President of the European Council in the debates on the future of Europe and for his commitment to the consolidation of the European project and the shaping of the future strategic agenda of the Union. The Romanian Prime Minister reiterated Romania's support for a strong, division-free Europe that stays united in all its political, economic and social dimensions. It was pointed out that the motto of the Presidency of the Council of the EU - "Cohesion - a European common value" - fully reflects this priority, which must guide the action of both member states and European institutions. In this respect, the European Council President emphasized the importance of conveying a strong message of unity at European level in the next period, including in the perspective of the Sibiu Informal Summit to be held on May 9, 2019. In this context, the Romanian Prime Minister reiterated the support of the Romanian Government for holding the Sibiu Summit in the best possible conditions, emphasizing that the necessary budget for this purpose was also allocated. As regards the Brexit process, Romanian Prime Minister stated that the Romanian Presidency of the Council of the European Union will particularly pursue the further observance of the citizens' rights after UK's exit from the European Union. In the context of talks on EU action in the Eastern neighborhood, the Romanian Prime Minister reaffirmed support for maintaining a substantive engagement of the Union towards its partners that voiced their option to further develop relations with the EU. The President of the European Council Donald Tusk commended Romania's efforts to advancing the European agenda and assured Romania and the EU Council of the European Council's support for the objectives of the Romanian Presidency aimed at strengthening the European Union in an inclusive manner conducive to concrete results for citizens. Prime Minister Viorica Dăncilă met with the the First Vice-President of the European Commission Frans Timmermans, on the occasion of the Romanian dignitary’s visit to Brussels. The two officials addressed important dossiers on the European agenda. The Romanian Prime Minister hailed the good cooperation and the constructive and constant dialogue existing between the Romanian Government and the European Commission and mentioned in this respect, the substantial discussions carried out in the context of the visit of the College of Commissioners to Bucharest, on January 10-11, 2019. The Head of the Executive also mentioned the fact that first month of the Romanian Presidency of the EU Council occasioned intense discussions on the advancement of the European agenda. The Romanian official reiterated at the same time the objective of the Romanian Presidency of the EU Council of acting as impartial mediator in order to identify the best compromise formulas, that would facilitate the most rapid advancement of ongoing negotiations on the European dossiers under debate. Moreover, the Romanian official reiterated Romania’s intention to act alongside the European Commission, to strengthen unity and cohesion. Other topic addressed pertained to the rule of law and the judicial independence in Romania. Prime Minister Viorica Dăncilă gave assurances that the Romanian Government will act for the observance of the values and principles underpinning the European construction: observance of citizens' rights and freedoms, observance of the rule of law, and the judicial independence, and it will equally act to make sure that the Romanian citizens enjoy the same rights and freedoms like any European citizen, in accordance with the general guiding principles, respect for common values, fundamental rights and freedoms, respect for the rule of law.